March 31, 2016, marks the bicentennial date of the passing of Bishop Francis Asbury. Fitting with his 45-year ministry in America is that he finishes his days on a lonely back road, virtually in the middle of nowhere, in the state of Virginia. The dramatic audio piece detailing the last days of Bishop Francis Asbury is complete! Below is the dramatic telling of the last days of his life, recreated in a moving audio production. The audio version of, My Work Is Done, is a 40-minute drama complete with rich dialogue, cinematic background music, and a dramatic portrayal of Bishop Francis Asbury and his close friends who give comfort and aid to the ailing bishop in his last days. The closing of the piece includes an interesting anecdote featuring the earthly items left behind by the last will and testament of Bishop Francis Asbury. Click on the podcast below and enjoy a step back in time, to the beginning of the 19th-century and the end of a magnificent life lived to the glory of God. Sitting upright in the tightly wound bed, the thin, ailing man surprises the others in the room when he ekes out a smile. It is a welcomed gesture, a pleasure inspiring the man standing at the edge of the oak bed to gently bend to one knee as he places his hand on top of the ailing man’s hand. Francis clears his throat, the strained rasp making it clear that this is an arduous task. An adjacent window’s feeble offering of sunlight begins to sink upon the pale, creased face of the aged itinerant, the deep furrows bespeaking nearly five decades of travel outdoors. The exposing beam furthers its cruelty as it discloses the sparse frame of a once vibrant and hearty man. The bones of this dear servant appear to cut through the blotchy skin of his formerly vigorous hands. The man who lovingly places his hand onto the frail hand of Francis Asbury is the Reverend Archibald Foster, ordained by Asbury as a Methodist itinerant 27 years before. The other man in the room, also visibly lifted by Francis’s smile, is also a preacher. In fact, he is a bishop of what remains of the colonial American Anglican Church, the Bishop Richard Channing Moore. Bishop Moore is rector of the Monumental Church in Richmond, Virginia. Since the end of the war with England, Bishop Moore has done his best to revitalize a church devastated by the evacuation of its English preachers during the revolutionary struggle. The pause is far from uncomfortable. The unexpected silence escorts into the dry and pallid room the welcomed chimes of dozens of spring birds as they lightly dance between boxwood and buttonwillow bushes. Their proclamations seem to indicate that any day now they will make their way further northward—a sentiment which mirrors that of the failing Francis. It is his strong desire to attend the General Conference in Baltimore on the second day of May. Opening his eyes, Francis removes his hand from beneath Reverend Foster’s hand, noticing how the reverend’s robust appendage stands in sharp contrast to his own waning extremity. Yes, my work is nearly done… Francis’s thought silently attests that he freely accepts God’s will. Francis’s sudden exclamation indicates that he is in pain. The last shout is followed by a long, low moan. Hunched over, Francis’s body clenches as it wrestles with wracking pain. The men in the room have by now grown grimly accustomed to Francis’s outbursts of pain. Reverend Foster gently places his hand onto Francis’s aching shoulders. After nearly a full minute of guttural groaning, Francis leans back. No one responds. Although they are glad Francis’s jubilant cries indicate the passing of the pain, they silently ache for their friend who is daily closer to departing this life for eternity. This time the men cannot help but respond. Both let out a short laugh. Reverend Foster recalls his earlier comment about Asbury’s sense of wit. “Just as I was saying…” All in the room grin in appreciation of Francis’s courage. “Yes, Bishop Asbury—as young John is warning, you should rest a day.” Reverend Foster’s agreement that Francis lacks the strength to preach masks his deeper concern for the bishop’s condition. John says nothing. He looks to Bishop Moore, who quickly responds, “John, please collect Bishop Asbury’s chaise; he longs to preach this evening.” Without hesitation, John departs. The young man John is the Reverend John Wesley Bond. For nearly the last three years, John has been the traveling companion of Francis Asbury. He, along with a driver, is charged with delivering the aging saint by horse-drawn carriage to each of Francis’s appointments. The 32-year-old preacher is actually far from young, admitted on trial at the Baltimore conference in 1810, six years ago. However, in light of the ecclesiastical experience in the room he just left, he is in the infant beginnings of his ministerial career. John is an attentive and loving man, constantly caring for the ailing Asbury. In the spring of 1814, two years ago, Francis was stricken so hard with sickness that John was certain death was near. He summoned Francis’s long-time traveling companion and friend, Henry Boehm. The two men watched as Francis’s chest heaved with every breath, struggling as though their declining leader was near to strangling. For two weeks, when Francis found strength enough to cough it out, an ugly mucus discharge was expelled. This was the beginning of Francis’s current condition. His extreme loss of weight, difficulty in breathing, and violent body pains all began with this illness. Worse, his persistent cough—which now allows only three hours’ sleep each night and keeps John from sleeping as well—is no longer followed by an expelling of mucus; Francis’s debilitating coughs are now followed by a discharge of blood. Loaded now into the four-wheeled closed carriage, Francis braces himself for travel. His frail arms lock at the elbows as his brittle, blemished hands clutch the wood bench in front of him. Seated beside him is the faithful John. Bishop Moore and Reverend Foster follow on horseback. 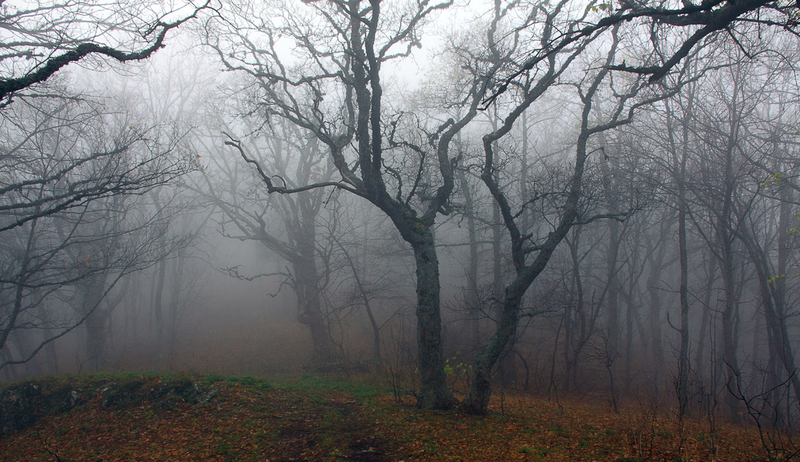 John smiles his reply, familiar with several of Asbury’s near-death experiences while traveling the treacherous paths over the Alleghany Mountains. Reverend Foster trots to the door and opens it, remaining outdoors as he patiently awaits John and his significant cargo. The young man carries Francis as a little child, the bishop’s thin back resting against his left arm as his legs hang lifelessly over his right. Entering the building, John and Francis move to the front. A wave of gasps accompanies their arrival as the gravity of the bishop’s condition registers with each person viewing the skeletal frame of their beloved Asbury. Every soul in attendance mournfully watches as John places Francis on a tabletop that resides within the pulpit. He gently sits Francis up, setting his legs to rest over the front side of the oak piece. Bracing Francis with his arms and reaching with his foot, he retrieves a small wooden stool to rest Francis’s failing feet upon. Continuing to support the bishop, John reaches one hand to carefully set the cloth-wrapped feet, swollen from an arthritic condition, onto the elevated aid—first the right foot, then the left. Facing the gathering of nearly one hundred people, Francis begins. A loud coughing spell begins, the uncontrollable hacking echoing inside the sanctuary. The worshipers do their best, but they fear that each cough could be Bishop Francis Asbury’s last. Those who are familiar with Bishop Asbury are well aware that he has struggled with this condition for nearly two years: preaching tickles his throat, which results in the unwelcomed coughs. With the episode past, Francis begins again. For nearly one hour, Bishop Francis Asbury preaches to the Wesleyan faithful in Richmond, Virginia. The effort is a chore for both the preacher and his flock, as the good bishop pauses between sentences, battling the coughs and drawing what at times seems to his faithful congregation his last breath. The attendees patiently accept their leader’s condition, the effects furthering their endearment for Bishop Francis Asbury. At the sermon’s end, John gently lifts Francis. The pair once again make their way to the rear of the church building, gratefully acknowledging flooded emotions flavored with praises to God for the outstanding life represented in the Methodist patriarch, Bishop Francis Asbury. Outdoors, John safely delivers his bishop to the covered carriage. They return to spend the evening at the home of Reverend Foster. Francis smiles his approval. The men continue their trek until sundown. Wednesday is not as favorable as Tuesday. The weather conditions have severely worsened. A driving cold rain greets John as he wanders outdoors, causing him to consider the circumstances. The temperatures are just above freezing. This is no time for the bishop to be outdoors. As he returns indoors, John’s opinion to cease the day’s travel is confirmed by the hacking coughs of Francis. The bishop once again lies in a tightly roped bed. His breathing is difficult, difficult enough to cause concern. Next to Francis is a cotton cloth, stained with blood coughed up by the ailing bishop. Thursday’s weather allows for travel, and the driver and his two passengers set out around ten o’clock. No longer does Francis rise at four in the morning. He is fortunate to rise by eight o’clock, most days at nine—and that is on nights when the hacking coughs will allow only four hours of sleep. John once again sits beside his bishop as the driver slowly makes his way toward Fredericksburg. But travel today is not as expected. Halfway through the day an unforeseen storm arises, sending cutting winds blowing through the vulnerable cabin of the carriage. Nearing four o’clock in the afternoon, John wisely counsels the driver to cease the journey. Despite Francis’s disappointment, he accepts John’s decision. Friday morning, March 29, the bishop once again battles with the bloodied coughs. His appearance is noticeably less vibrant than in previous days. John worries for his bishop, wondering, Shall this be his last day? Leaning forward in the chair, Francis clears his throat and responds, “We must make haste for Baltimore.” A severe coughing struggle follows his barely audible words. Reaching for his coughing rag, Francis utilizes the bloodied cloth to help complete his respiratory struggle. He nods to John, pointing toward the door. The carriage sets out slowly. For the next few hours the driver does as instructed, maintaining a slow pace. John watches his beloved friend as each jolt of the rustic road brings a shout of pain, each ending with a muffled shout of “Hallelujah!” Nearing the early afternoon hour, it is clear that Francis can no longer handle the travel. His hands gripping the wooden bar in front of him consistently slip their grasp; he endures a bout of bodily pain every ten to fifteen minutes—a marked increase from the usual once every two hours. The resulting cries of pain seem to worsen the bishop’s condition. John is beginning to realize that the travel must cease. John is happy that Francis is bringing the journey to a halt, but he is also concerned. He gently takes Francis’s hand and, with a soft tilt of his worried face, acknowledges Francis’s request. Leaning out the carriage window, John informs the driver, “Aim for Arnold’s.” The driver, familiar with the farm of George Arnold, responds with a wave of his hand. Mr. George Arnold resides on a large estate consisting of 164 acres. It is an out-of-the-way location, completely rural, away from anything of note. One of Asbury’s typical back-country roads leads to the Arnold farm. George lives there with his wife and eight children, four sons and four daughters. His life is one of grateful support of the Methodist cause. It was in the early days of Bishop Asbury’s ministry in America, during the American Revolutionary War, that George Arnold experienced the preaching and teachings of the Wesleyan movement. In time, Mr. Arnold was not only convinced of his need of a savior, he was also persuaded to free his two slaves. With a new focus in life, the farmer George Arnold set out to spread the Methodist message, or more importantly, the universal message of the Gospel. For the last three decades, he has financially supported the building of several Methodist church buildings in the state of Virginia. John walks Francis to the edge of the bed and places the ailing bishop onto the duck-feather mattress. The soft pad engulfs Francis. From behind John, George’s wife helps her two daughters gently place a heavy quilt over Francis’s trembling body, adding, “This shall keep him warm.” Mrs. Arnold nods to her girls and the women depart. “As well.” With this, Francis once again nods off to sleep. For the next five hours, John and George watch as Francis battles bodily pain. He is no longer screaming in anguish—that ability has evidently expired—but it is clear from his facial and bodily contortions that Francis is wrestling with unbearable pain. For nearly an hour, John and George kneel in prayer for their bishop. Nearing dawn, Francis once again rests in sleep. His bodily struggles continue, but with much less severity. He no longer tosses and turns, but settles into one comfortable position. A look of contentment lights his face. “That is good. Eat; you men are here if the bishop needs you.” The men endeavor to finish the soup and bread. Befuddled by Francis’s insistence, John looks to George and shrugs. “I suppose we should raise the bishop.” Both men come to his aid, gently raising Francis upright in the bed. Within moments, the boys return with a large cushioned chair. It is an odd piece of furniture, a gift to Mr. Arnold by a French general who aided the colonists in the struggle with Great Britain. Setting the chair next to the bed, the boys join John and George in attempting to raise Francis from his feathered cocoon. George sternly admonishes, “Careful with the bishop, boys.” It takes a few minutes, but they soon have Francis sitting upright in the chair. George and Mrs. Arnold, along with their boys and the daughters who are slowly making their way into the room, each look to John. John doesn’t know how to reply. First, he cannot believe that Francis is well enough to sit up; second, he has seen the devastating effects of Francis’s ailment as it has nearly destroyed his beloved friend. The thought enters John’s mind, How can he be well enough to attend a meeting? Sensing that God is giving a last reprieve—and perhaps a short one—John makes a request. “Please, George, hand me a Bible.” George reaches for the Bible on the table next to the bed and passes it to him. As John reads, he is doing his best to focus on the Scriptures. His attention floats back and forth between the reading and the looks on the Arnold family’s faces. Each one is drawn to the growing smile on Francis’s face. George pronounces, “The bishop beams!” The family rejoices in the elevated spirit of their beloved bishop. Considering this God’s time for Francis’s last meeting, John opens up with a Charles Wesley hymn. The family sings along. Although he fails to make a sound, Francis mouths the words which for almost an entire century have brought healing to many throughout Europe and in parts of Asia and America. After the song, John offers a prayer of thanks for the work of God through his humble and obedient servant, Bishop Francis Asbury. Francis continues to smile his thankfulness. Sitting back against the chair, Francis opens his eyes and notices the anxiety on the face of his young companion. He wishes to inform the young man that all is well, but he is unable to speak. With one arm completely raised toward heaven, the bishop beams a wide grin. With all the strength he can gather, Bishop Francis Asbury raises both hands toward heaven. It is a difficult task, but he accomplishes his goal. With arms extended, the bishop opens his eyes. John thinks to himself, His body is dying, but his blue eyes continue to gleam. Francis’s face continues to radiate. John and George look to each other and to the bishop, marveling at this last effort of praise. Francis lowers his hands, his smile relaxes, and his head begins to droop to one side. John quickly raises his hands and cups the bishop’s face between them. Francis’s breathing is slow and deliberate as his eyes slowly begin to close. A sigh escapes as his body begins to recline. The growing weight of the bishop’s head in John’s hands indicates either a relapse into sickness or that the end is not far. He draws Francis close. After a few minutes, leaning his head and body on his young companion, Bishop Francis Asbury breathes his last breath. Revelation 21:1-8 Scripture taken from the New King James Version®. Copyright © 1982 by Thomas Nelson. Used by permission. All rights reserved. 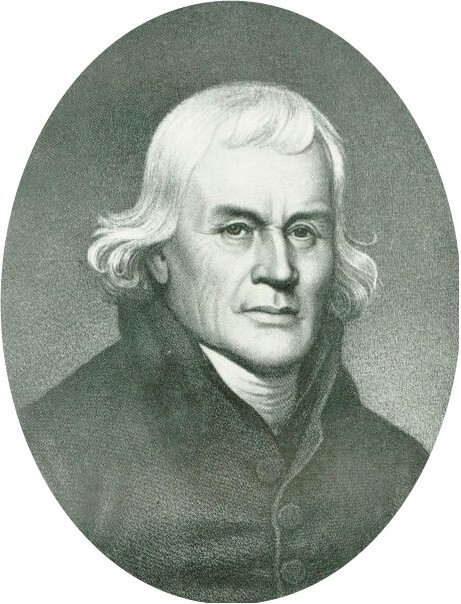 An interesting note about the death of Francis Asbury is that in his personal will, Francis left his clothes, his horse, books and manuscripts to his Co-Bishop, William McKendree. After the May 1st, General Conference in Baltimore, the conference where Asbury’s body was brought to from its temporary burial spot in Virginia for a proper funeral and burial, a young itinerant by the name of Jacob Young was given the task of delivering Francis’s items to Bishop McKendree, taking them across the Allegheny Mountains to Wheeling, Virginia. A splendid piece, Al. Very moving, indeed! I gained information that I did not know, and your writing style is excellent. Thanks, too, for the graphics. I copied the carriage picture, and I’ll add it to a PowerPoint lecture for one of my classes. Again, good work, Al. Many thanks. Thank you, Dr. Kinghorn. 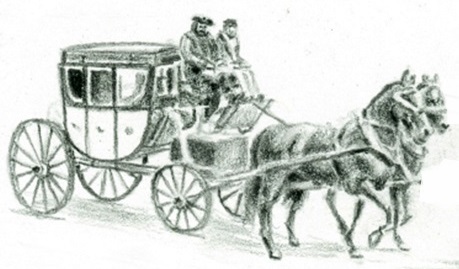 I will inform the artist, Tyler Fegley, that you plan to use his carriage drawing in class lectures. He will love that! Thank you, Daryl. I’m glad you enjoyed it. Try the book. It will take you there!